When migrating your site to a new server, you want to test your site before updating the DNS to point to the new server. 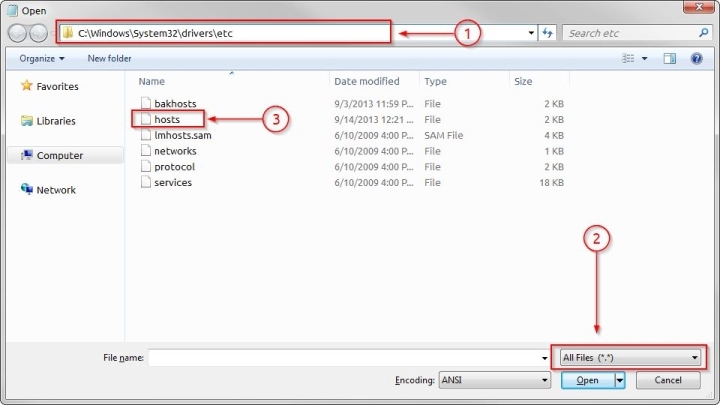 To do this you can use your computer's hosts file to force your computer to visit the new server when visiting your domain name. Your computer's hosts file is a local repository for resolving a domain name to an IP, and this method predates modern DNS systems. The computer checks its hosts file before making any DNS requests to resolve a domain. This allows you to adjust your hosts file to force your computer to visit a different IP address when visiting your domain name. Below is example from a Windows hosts file that shows google.com and www.google.com pointing to a different IP address than what is reported by a DNS lookup. Windows might ask if you want to let Notepad have administrator privileges, you'll click on "Yes". On the last line add your entry as shown below then save and close Notepad. This example assumes we want to point domainname.com to 0.0.0.0. Where you will replace "0.0.0.0" with the IP Address of your site in our system. The IP Address that you need to use can be found in your cPanel, WCP, or New Account Information email. On the last line add your entry as shown below. This example assumes we want to point domainname.com to 0.0.0.0. SSH into your console or open your terminal if you run a GUI on your Linux machine. Note: If you plan to test with the www version of your domain name, you must add an entry for the www version of your domain to the hosts file. You may also need to flush your computer's DNS resolver cache after making these changes too. This page was last modified on 6 February 2017, at 12:39.